Yes, I am thankful that Peanuts doesn't eat poo or wallow on mud. But today, she just played with the wrong toy. I heard her barking repetitively (the sound I hear when she gets fixated on a toy). Of course, since we were inside the house, I didn't mind following her everywhere. It was a dead little mouse. Had I allowed her to, she would've probably added the dead mouse into her toy collection. 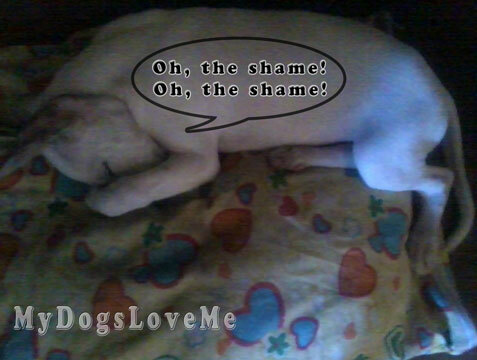 You are guilty of the said act and should wallow on shame- but let me take a picture of your cuteness first! Hahaha Peanuts! We're so glad, though, that your Mommy saw it before you added it to your toy pile. Lol, How could I not see it. It was under my work table and she was play biting with it. LOL. I'm glad it hasn't been added in her toy pile. Eeeek! Peanuts! Momma needs to get you a stuffed mouse now to thank you for finding that one! LOL! Imagine a mouse in the size of a pinky... talk about finger food. Well, at least I now have an idea for a Valentine Gift. I remember the days when I used to loose my teeth, around the same age as Ginger, Mum found some by standing on them on the carpet, I think she's still got about 5 in a little box, no idea why she's keeping them?! So I supposed I'll be giving this one to the canine tooth fairy. I can relate to this whole story! Except the tooth popping out part. That would have been scary! I wonder what surprise Indiana brought you :? Peanuts must have some kitty genes:) Hope the tooth fairy pays a visit to Ginger - something really tasty. Hope the tooth fairy gives us something in dollar currency ^_^. I was thinking since Peanuts is a terrier mix, she was born to play track the mousy. She's actually fine. The bleeding stopped instantly. It was a relief. Too funny!! Thankfully I've never come across my guys using a mouse as a chew toy. I hope it never happens! I certainly hope so... It gives a new meaning to the word predator-ish behaviour. LOL. Well enough that she doesn't carry anymore of her newly found friends... hopefully. Oh yucky!!!! Peanut should stick to only playing with real toy toys... Dead mice are not good chew toys. If I had my way with the rules, I would've set my foot down and not allow those mice in the house. Oh dear. I think this should have been on Monday Mischief too! I actually typed it on a Monday... I hope that would count. You have such a wonderful blog and the adventures you have are so much fun. 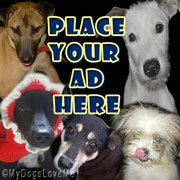 Congratulations and dont forget to pass it on to 8 others and encourage other pet bloggers as well!! Thanks. I'll get to it with Helen's Kreativ Blog Award. So what's wrong with chewing on a dead mouse?? Think of all the extra vitamins and minerals Peanut was getting!! BOL!! Believe me, with 2 cats and 6 dogs we have had our share of rodent catches around here! I knew something had happened to her ^_^. Is she okay? Can you show us how she is now? It just breaks my heart how people are capable of taking responsibilities they can't handle. This isn't a job, we're talking about another life form, here. Oh eww ick Peanuts! Yuck. You're supposed to play with fake mice, not real ones! Ginger didn't even make a sound. My partner was just surprised when it fell on his hand. Yes, I think I'll be getting her one this Valentines Day. Oooh dear, poor Mr Mouse! Peanuts you are adorable! Better a mouse than a chipmunk or raccoon. I imagine how Sampson would be with such tendencies. Maybe Peanuts is part cat! I could imagine that. She does love climbing up and down the couch... if that counts. Peanuts, we are just not sure mousies are good playthings although you sure made it sound fun. Here in New Mexico, Momma freaks out about mice because some of ours in the wild have Hanta Virus so she says we can't play with ANY rodents. We hope the tooth fairy brings Ginger a nice chewie bone. And momma is still under the weather but is taking LOTS of vitamin C, eating cranberries, drinking green tea (she still is kinda crabby...don't tell her I said that). Haha.Vitamin C is good for your momma. Good thing she's taking care of herself. Ginger will probably be given treat biscuit for being such an angel when it fell. That's scary. Mice here can bring Leptospirosis, it's a deadly disease too...good thing she's finished all her shots. Oh boy! A dead mouse...that would be fun..haha! Hoping she could transition her interest to something less organic. Ahhh! Rodents are number one on my list of things that gross me out...you handled it much better than I would've, thats for sure! And yes, I am definitely proud of being the brave little grossed out biped that I am. A dead mouse?? Peanut you rock at mouse hunting!! Now all the cats have to pay homage to you! Peanuts! No shame...TOTAL respect. That would freak out my peeps! Haopee, Here is a link to the Starfish Story we mentioned on Wed. blog. http://www.adifference.com/starfish-story.htm it is a story that drives and inspires us; we hope you find meaning in it as well.